If you’re like me, you would do anything for more energy through the day. Chasing around two kiddos, cleaning the house, and getting all of our meals prepped for the day… Whew! By 2 pm, I crash, which makes me reach for the unhealthy coffee drinks to get me through the day. Put that coffee or energy drink down, I say! We’ve got 6 all-natural fresh fruits, veggies and boosters to reach for to give yourself a natural burst of energy that will help supercharge your body for the whole day! This yellow beauty comes with a boatload of natural energy. Loaded with potassium, fiber and b vitamins, bananas are a great pre and post workout fuel as well as a crazy nutritious snack. A cup of berries gives your body a good amount of healthy Vitamin C. This is great for a natural boost of energy and is filled with fiber—great for keeping things moving regularly. Check out this post for our 5 top berry picks. These vitamin C powerhouses provide a quick burst of energy and endurance. Citrus fruits are easy to add to any green smoothie by squeezing the juice from a half of lemons or limes or tossing in some peeled oranges or clementines to your recipes. We love adding these 8 citrus fruits to our blenders for a burst of Vitamin C.
The powerhouse of veggies, leafy greens contain vitamins A, C, K, Magnesium, Iron and the almighty B which all provide natural energy and keeps your energy levels up and running throughout the day. Check out this post for all the wonderful leafy green options. Full of magnesium, most nuts provide a quick pick-me-up and help to keep you there. Instead of reaching for a cup of coffee, reach for a handful of your favorite nuts. *tip* Be kind to your tummy and blender. Soaking nuts in water the night before helps with digestion and is also easier for your blender to chop them up without hurting the blades. Chia and Sunflower seeds help regulate your blood sugar giving you energy throughout the day. They’re a great source of fiber and protein and you can’t beat that crunch factor. Here’s our top 6 reasons why we love chia seeds. Keep a handful of these items on hand at all times if you’re struggling with keeping your energy-levels up. You’ll thank yourself later! 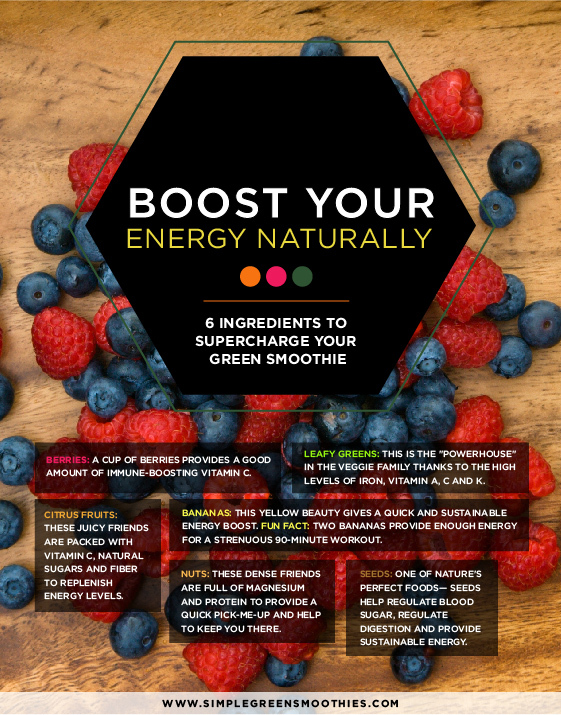 What are your favorite natural energy boosters? Share what works well for you in the comments below.